Not sleeping enough or going to bed too late leads to a reduction in the volume of grey matter in the brains of adolescents. These conclusions were obtained by researchers at Inserm Unit 1000, “Neuroimaging and Psychiatry” (Inserm/Paris-Descartes University/Paris Sud University), who studied the brain and sleep habits of 177 14-year-old students. This work is published in the journal Scientific Reports, and received support from the Academy of Finland. 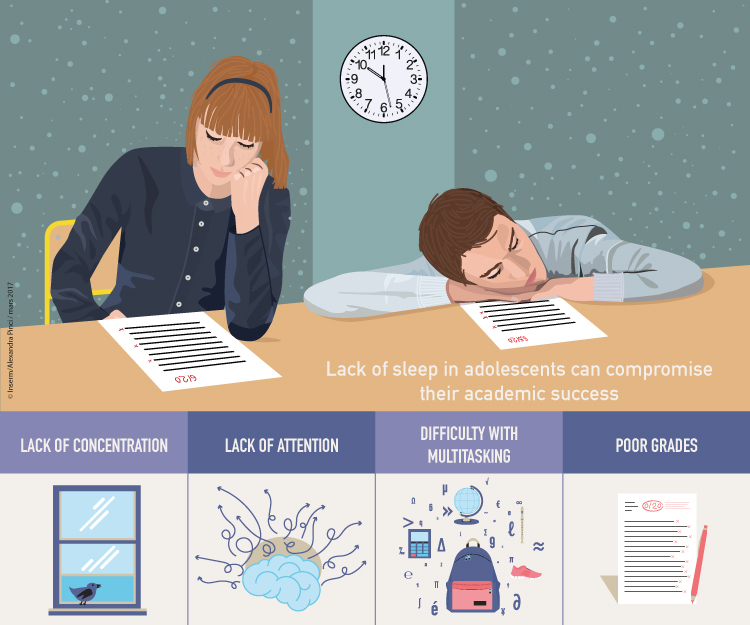 Lack of sleep in adolescents can compromise their academic success, and their health and safety. Shortened or delayed sleep has consequences for academic performance. There is still debate over the time at which lessons should begin in order to benefit the health of adolescents. However, researchers did not know until now whether or not poor sleep habits in adolescents were associated with damage to the anatomy of the brain. A collaboration between researchers from Inserm and from the Finnish National Institute for Health and Welfare, supported by the Academy of Finland, shows for the first time a link between sleep habits and brain structure in young adolescents. The researchers studied the sleep habits of 177 14-year-old students attending secondary schools in the Paris region. On average, the adolescents went to bed at 10:20 pm on week nights and got up at 7:06 am, and went to bed at 11:30 pm at weekends, getting up at 9:45 am. 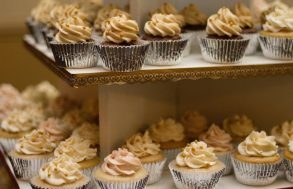 But there were large discrepancies between the adolescents. The researchers found that a short period of sleep (less than 7 h) during the week, and going to bed an hour later at weekends were correlated with smaller volumes of grey matter in several regions of the brain (the frontal cortex, anterior cingulate cortex and precuneus). “The most significant result from our study is very definitely the finding that the later the adolescents go to bed at weekends, the greater the reduction in their volume of grey matter,” explains Jean Luc Martinot, Inserm Research Director and last author of this work. These 3 regions of the brain are particularly involved in attention, concentration, and ability to multitask. 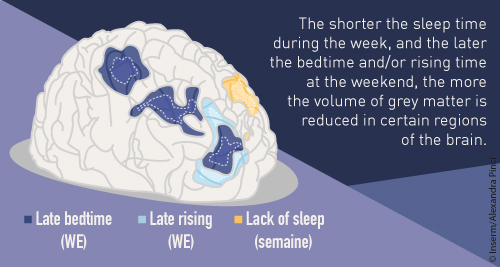 Moreover, the researchers observed an association between poor grades obtained by students and smaller amounts of grey matter in their frontal regions, the regions in which the volume is reduced by late bedtimes at weekends. 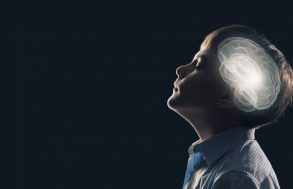 These results show that there is a link between poor sleep habits, brain structure (still actively undergoing peripubertal maturation), and poor academic performance. For the researchers, this study suggests making sure that adolescents acquire good sleep habits during this period of brain maturation. “We encourage parents, social workers and school liaison officers to promote the maintenance of a good sleep-wake routine for adolescents. In particular, avoiding routinely late bedtimes during weekends seems important for optimising the brain’s potential for development and for supporting academic success,” concludes Jean-Luc Martinot. 1 Institut National de la Santé et de la Recherche Médicale, INSERM Unit 1000 “Neuroimaging & Psychiatry”, University Paris Sud – Paris Saclay, University Paris Descartes – Sorbonne Paris Cité, 97 Bd de Port Royal, 75014, Paris, France. 2 National Institute for Health and Welfare, Department of Health, Unit of Mental Health, P.O. Box 30, 00271 Helsinki, Finland. 3 University of Helsinki and Helsinki University Central Hospital, Department of Psychiatry/ Adolescent Psychiatry, P.O. Box 803, 00029 HUS, Helsinki, Finland. 4 Department of Psychiatry 91G16, 4 place du Général Leclerc, Orsay Hospital, 91400 Orsay, France. 5 Adolescent Psychiatry Department, Medical school, FI- 33014 Tampere University, Finland. 6 Department of Psychiatry, Université de Montréal, CHU Ste Justine Hospital, 175 Chemin de la Côte-Sainte-Catherine, Montréal, QC H3T 1C4, Canada. 7 Department of Psychological Medicine and Psychiatry, Institute of Psychiatry, Psychology & Neuroscience, King’s College, 16 De Crespigny Park, London SE5 8AF, United Kingdom. 8 Departments of Psychiatry and Psychology, 6436 UHC, University of Vermont. 1 South Prospect Street, Burlington, VT 05401, USA. 9 APHP, Adolescent Psychopathology and Medicine department, Maison de Solenn, Cochin Hospital, 97 Bd de Port Royal, 75014 Paris, France. 10 CENIR at ICM institute, Centre de Neuroimagerie de Recherche Bâtiment ICM, 47-83 boulevard de l’Hôpital, 75651 Paris Cedex 13,ss France.